The Northern State University School of Fine Arts will present their fall Jazz Concert at 7:30 p.m. on Nov. 13 in the Johnson Fine Arts Center Harvey and Cynthia Jewett Theater. 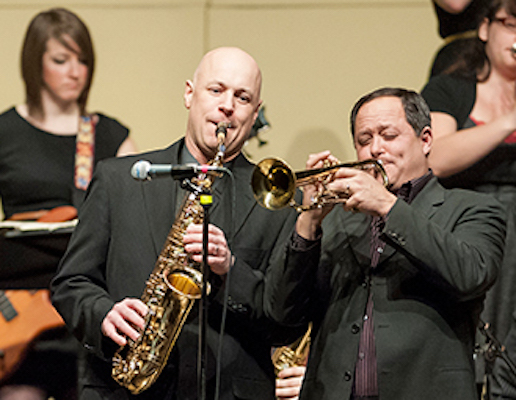 Ensembles performing on the concert include the 2 O’Clock Jazz Ensemble, directed by Dr. Grant Manhart, NSU professor of music; Vocal Jazz Ensemble, directed by Dr. Wendy van Gent, NSU associate professor of music; and the NSU Jazz Combo, directed by Mr. Fred Hemke, NSU assistant professor of music. The concert will feature performances of pieces such as Count Basie’s “Basie Straight Ahead,” “Here’s That Rainy Day” by Stan Kenton, Frank Sinatra’s “Saturday Night is the Loneliest Night of the Week.” In addition to these pieces, the 2 O’Clock Jazz Ensemble will be joined by Dr. Alan LaFave on Artie Shaw’s “Begin the Beguine,” as a tribute to Dr. LaFave’s long-standing tenure at NSU. In December, Dr. LaFave will begin his new position as President of Valley City State University in Valley City, N.D. Admission is $5 for adults, $2.50 for NSU faculty/staff, and free for school-aged children or NSU students with ID. For ticket information, please call 605-626-2900. Tickets can be purchased at the Johnson Fine Arts Center Box Office or online via the School of Fine Arts Page (northern.edu/artsnsu). Box office hours are Monday, Wednesday and Thursday, noon-4 p.m. The box office opens two hours before the show begins on performance nights.